Want to sell more stuff, recruit more reps, and make a whole lot more “moola” in your business? Are going to share exactly what strategy they’ve used to grow their business, and the specific formula they use to write their ads. This is what we focused on in the beginning, and is still what we work on to this day. And we’ve come a long way in just the past couple of months. We were over $30,000 in debt that we accumulated trying to build our network marketing business, while driving from town to town, prospecting on the streets and in malls. Today, in contrast, we’re top affiliates at Elite Marketing Pro, and now we exclusively build our business online, from the comfort of our home. We’re immensely grateful for our journey, because we’ve lived the pains of the people we’re looking to help—our target market. Get really good at telling your story to your target market! It’s your story that makes you who you are; it makes you unique. It’s a loud, crazy world out there, with lots of people advertising, so when you are willing to reveal certain things about yourself and your story that most other people keep to themselves, you stand out. They can’t imagine those things for themselves. Everyone has their own pains, and everyone is touched by, and can relate to, your pains. Once you get good at putting your story into an ad, you can sell anything you want! Now let’s get into our successful ad formula. I don’t care what platform you’re using. This strategy works on Facebook, LinkedIn, YouTube, Instagram, or any other social media platform. Where you specifically use it is tactical, but the formula itself is strategic, meaning that it applies anywhere and everywhere. We even use this same formula in our Facebook Lives—it’s universal. Maybe you’ve heard it said: if you try to advertise to everybody, you will attract nobody. Always remember that when you’re advertising, you are not advertising to the masses, you are speaking to ONE person. Now, what is the pain that your ideal prospect – that one person – is going through? Any time we sit down to write copy for anything, we start by remembering that pain we went through. Remember, it’s been just a few months since we’ve been out of the basement. Our memory of that pain is still fresh. As we read it, and write about it, it’s gut wrenching. You need to write from that pain, where the experience is coming from. Sometimes that can be hard for those who haven’t been through that kind of experience. The cool thing about writing is that you can watch other people go through a struggle, and write that copy from an outsider’s perspective, based on their experience. This is where 95% of people struggle with advertising, because learning to write from the pain is a skillset that takes time to build. Some people take longer to learn it. Others take less time. But following this formula is going to make the process a lot easier. It just means there’s a huge opportunity for you to do something different to make yourself stand out. That’s why they keep making them, right? Every underdog movie is exactly the same story – just with different characters and a different plot. It’s the same thing when it comes to writing your ad copy. You might be telling the same story, but you’re a different person and it’s a different plot. You might be writing about the same pain points, but the plot and the characters are going to be different. What you’re doing is taking people on a journey with you, and visiting pain points along the way. You’ll just hit two, three, maybe four pain points, and then you’re going to move into step two of the formula, which is the solution to the pain. The solution or benefit is what you’ve found to get out of that pain you were feeling. For example, let’s say that you are in a health and wellness MLM, and you offer a weight loss shake. …and talking about whatever pain it was that made you want to lose the weight. What was the pain you felt before you lost that five or ten pounds? Did you just feel unhealthy? Were you exhausted all the time? Maybe you were a mom who still hadn’t lost the baby weight after three years and you were terrified to wear a bikini in public. A guy I know mastered his pain story—when he writes about his weight loss journey, he actually shares about how he was so uncomfortable with the way he looked that he’d turn out the lights when he was intimate with his wife. If you can get into the heart of the person who is reading your ad, then they’re going to be willing to listen to whatever else it is that you have to say. Instead, your solution is to provide education – how you changed your lifestyle, how you changed your mindset, how you changed your diet, etc. Help them get clear on their wants and desires from where they’re currently at. Once you’ve established the pain point, you have their attention, and they’re listening to you. What are their wants and desires moving on from that pain point? Where do they want to go from here? That’s where the solution comes into play. Once you’ve gotten their attention, you must educate them first. Now ask: what is the benefit for them, if they take action? You’ve established the pain point, you’ve educated them, and now what is the benefit for them for taking action? How is this going to help them move from where they’re currently at, to where they want to be? The “Call to Action” is the single most important part of the ad. You might do everything right in the first three steps, but if you don’t put the icing on the cake with the right call to action, your ad won’t work. So don’t drop the ball! Because if you don’t give them a direct call to action, you’re not helping them move forward and change their lives. You want to give them the option to connect with you, right now! And tell them exactly how to do it. Now, that’s our 4-step formula for writing a winning ad. Does it keep the reader interested, or is it kinda dry and boring? Does it focus on the benefit to that reader? Again, are you speaking to ONE person and telling them a story they can relate to? Is it easy to understand; easy to read? Does the reader know exactly what I want them to do when they are finished reading my post or ad? Remember, the call to action is the most important part of your ad. So make sure that you stay clear, on point, moving forward throughout your message. Sometimes, especially when you venture into the land of long story ads, you end up being repetitive. Does this need to be here? Is this important for my story? Does it make the reader want to read the next line? The point of every line is to get them to read the next one. If they’re not willing to read the next line, you’ve lost them. So make sure that you’re taking them on this journey with you fairly quickly. This question gets the wheels turning. It all comes from being unique, and telling your own story. Stop with the “cookie-cutter” ads, okay! If you run generic, cookie-cutter ads, without sharing anything personal about yourself whatsoever, you’ll never have success. Remember what training is: training is just training; it’s a guideline. YOU have to fill in the gaps. Whether it’s training about writing a post or running an ad, it’s all about making everything unique to you. When we started, we understood that right away. It’s what helped us build a lot of momentum. We wanted to make everything unique; different from everyone else’s. I guarantee that your story will relate to people that our story won’t. That’s the beauty of being a human being; we each have our own story to tell. 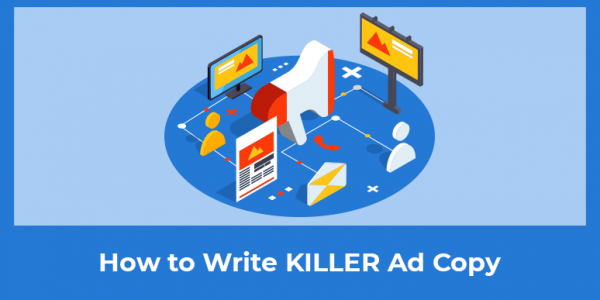 Follow this four-step formula, understand the essentials, and you will rock it when you write your own ad copy! And your homework is to sit down and write some killer ad copy, right now. If you start right now, by the end of this week, you will have written a killer ad or post—virtually guaranteed. And if you’re a network marketer and you’d like to learn more about building your business online (instead of pitching friends and family, or stalking strangers at the mall like we used to), then I strongly encourage you to sign up for our FREE 10-Day Online Recruiting Bootcamp. This is the exact same information we used to get started on our journey of learning how to market ourselves online. You’ll see firsthand the process Ferny Ceballos, CMO of Elite Marketing Pro, uses to passively generate 300–500 leads per day, 30–50 customers per day, and onboard 70–100 new serious business-builders each month. And you’ll learn how to use online methods to rank advance, sell more stuff, recruit more people, and make a whole lot more “moola” in your business. Click here to access our 10-Day Online Recruiting Bootcamp.